Tiger Woods avoided a penalty on the 18th hole during the second round at the Hero World Challenge as Jon Rahm produced a brilliant performance to move into a tie for the lead with Henrik Stenson. Woods, who is hosting the tournament in The Bahamas, carded a three-under 69 to move to two under at the halfway point. However, Woods had problems with his putter, missing four putts from within 12 feet on the first eight holes and, despite five birdies, his round ended in controversy at the last. He carded a double bogey on the 18th but was fortunate not to be penalised for a double hit when negotiating the rough. After a long review, officials reportedly determined that Woods did indeed hit the ball twice, but, since they needed slow-motion high-definition video to see it, he was not assessed a penalty. "I didn't feel like I made contact twice," said Woods. "It was such a short little shot. I was just trying to hit it sideways there. Under slow-motion and high def, you can see that the ball hit the clubface twice, but there's – I don't know, there is no penalty. "In slow motion, you can see I did hit it twice, but in real time, I didn't feel that at all." 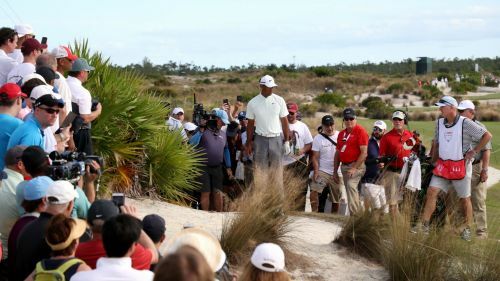 Mark Russell, the PGA Tour's vice president of rules and competition, said: "Basically it [the rulebook] says if the player did not know that he did that and the only way you can tell that is by using this type of slow-motion technology, he's exempt from the rules. So there's no penalty there." The Spaniard is now 10 under, level with Stenson at the top after the 2016 Open champion carded a 66. Dustin Johnson and Patrick Cantlay are tied for third on nine under, with Tony Finau a shot further back in fifth. Gary Woodland and Alex Noren hold a share of sixth on six under. Defending champion Rickie Fowler recovered from a testing first day to shoot a five-under 67 for outright eighth.